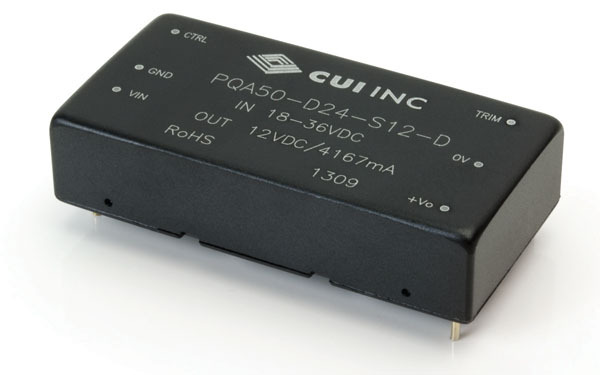 The PQA50-D is an ultra-compact 50-W DC-DC converter that reduces board space and costs in telecommunications, industrial and IT equipment applications. The DC-DC converter family features a 2“ × 1“ (50.8-mm × 25.4-mm) footprint and incorporates six-sided metal shielding for improved electromagnetic compatibility (EMC) performance and efficiency up to 93%. The single-output isolated DC-DC converter modules feature a 2:1 input range and are available with an 18~36 VDC or 36~75 VDC input voltage range and 3.3-, 5-, 12-, 15-, or 24-VDC output. The series features 1,500-VDC I/O isolation and protections for output over voltage, short circuit, over load, and input under voltage. The series offers precise voltage regulation, featuring load regulation of ±1% maximum from 10% to 100% load and line regulation of ±0.5% maximum. The PQA50-D converters’ additional features include a –40~85 °C operating temperature range, remote on/off control, and ±10% voltage adjustability. Pricing for the PQA50-D series starts at $85.12 in 100-unit quantities.